Treetop Cottage offers you a relaxing retreat nestled in native oaks trees. Wide-open views take you beyond nearby rooftops to the vista of Black Mountain in the far off distance. 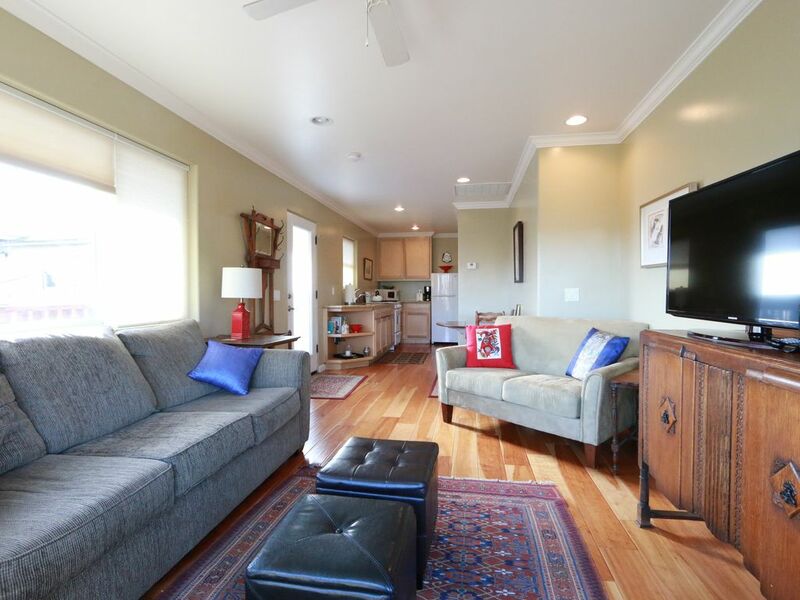 The cottage is private, yet, only a 15 minute walk to the heart of the historic Paso Robles downtown. Enjoy concerts in the park or visit the many wonderful restaurants and wine tasting rooms downtown. Farmer's Market is held Saturday mornings and many weekend events are scheduled in the Park. A supermarket just two blocks away if you want to stay in and cook. Everything is here to make your stay carefree. Paso Robles is Right in the Middle of Wine Country & World Class Golf! Treetop Cottage is Perfect for Every Outdoor Enthusiast & Any Avid Cyclist. Sit Back and Enjoy a Good Book or Just Watch the Passing of Time as the Sun Shifts on the Horizon. We hope Treetop Cottage provides an escape for you to thoroughly relax. When we are home we collect antiques with my parents who are collectors and restorers. We've added a few pieces to make our home more welcoming for you! We love the friendly atmosphere in Paso Robles and appreciate our local activities in our downtown park. Nothing beats a wonderful bike ride out on our country roads or a kayak paddle in the estuary in Morro Bay. Enjoy everything Paso Robles has to offer. Discover the unique history of Paso Robles and learn about our Salinas River which runs South to North! We have always loved living on the Westside of Paso Robles. We have tree lined streets and charming homes which reveal the history of Paso Robles in its architecture and town layout. We built our Treetop Cottage in 2010 - just behind our main home creating a hidden cottage. We created a peaceful retreat for those times when we come home to see family and friends. Enjoy exploring Paso Robles as we have for over twenty years! Treetop Cottage provides comfort humbled by nature. Private washer & dryer for Treetop Cottage. Bring your iPod - We provide a docking station with speakers. Treetop Cottage is hidden behind a main house. Both properties share a lovely garden and small walking tour. You won't have to go far if you want to get outdoors but stay home too. Treetop Cottage is a great location for watching the sunrise over Paso. The cottage is comfortable , clean and well equipped. Wonderful property and the views are unbeatable! The property was clean, well appointed, and ready for our stay. Super easy check in, check out process, and the view from the porch was worth every penny!!! Absolutely loved this place, and it was so close to downtown it made meeting our group super convenient. Our only critique was the bed is pretty small. It looked like a queen online but ended up being a full size mattress or smaller. Everything else was great! Thank you for the nice review. We apologize if the bed felt small to you for some reason but we did want to mention that the bed in the cottage is most definitely a queen size. It is a standard queen size bed as is all of the bedding we use for it. Maybe you have a larger king bed which may have made it seem smaller. We just want to make sure other folks don’t see this review and think the mattress is a full or smaller as you have suggested. Bright, beautifully-appointed, welcoming, cozy home-away-from-home!!! We left a piece of our hearts in the adorable treetop cottage! It is truly even more spectacular in person! And the hosts went above and beyond to make our stay incomparable! We cannot wait to return! The cottage is beauty located overlooking Paso. The cottage is clean, well maintained and appointed with the necessary equipment to cook simple meals. My wife and I had a great stay. Very clean! Will definitely book again. Wine Tasting & World Class Golf in the near vicinity to Paso Robles. There are many restaurants in Downtown Paso Robles. Outdoor Activities Abound: Cycling, Water Sports at the Lake or at the Beach (both 30 - 40 minutes away). Lake Nacimiento & Lake San Antonio are only half an hour away too. Boutique Shops and Several Antique Malls in Downtown Paso Robles & Throughout the County & Coastal Cities. Hearst Castle is only a 40 Minute Drive Away. There is a Multiplex Cinema in Paso Robles & Atascadero Showing all Current Releases. There is an Independent Theater Showing Foreign & Independent Films in San Luis Obispo Half an Hour Away. There is a Hot Springs Pond east of Paso Robles if you want to soak in the sunshine or the moonlight - Open Until Midnight. There are Many Things To Do....or You Can do Nothing At All and Just Relax! Add 11% for Paso Robles Occupancy Tax Rentals over 30 days do not have to pay occupancy tax, but we do require a mandatory cleaning every 2 weeks.